MANILA, Philippines — Kungfu Reyes still remembers the sting of University of Santo Tomas’s (UST) loss to University of the East (UE) in UAAP Season 80, when his Golden Tigresses hit rock bottom in what would turn out to be the worst year in program history. The Lady Warriors seized a 25-23, 18-25, 28-26, 26-24 triumph over the Sisi Rondina-powered Tigresses back in March 2018, the first time that UE had beaten UST in the Final 4 era. “Noong na-disgrasya kami last year, talagang wala ka nang pwedeng idahilan doon,” said Reyes, who saw a 25-point outing from Rondina go down the drain in last season’s defeat. “Talagang talo, wala eh. Ganoon lang ang pwede, i-accept namin, that’s the reality, wala ng pwedeng drama pa,” he added. In Season 81, however, the Tigresses made sure that no such upset would take place. Matched up against a mostly intact UE squad, UST came away with a 25-18, 25-14, 25-20 sweep. It took them just an hour and 26 minutes to complete the win. Rondina was superb, tallying 17 points with 16 coming off attacks. She got plenty of help from rookie Eya Laure, who had 15 points on 11 kills, 2 blocks, and 2 aces. Their defense shackled UE to just 26 attack points in the game. “Ngayon, ang dami ng talent na dumating,” Reyes said of his team, who has won three straight matches even after losing reigning Rookie of the Year Milena Alessandrini to a season-ending knee injury. “Mas in high spirit kami, na alam mo ‘yung tropa mo, sitsitan mo lang alam na ‘yung ikekembot, kung ano ang gagawin nila. Malaking bagay yung good communication, two-way process na nangyayari lagi,” he said. “Maganda na ‘yung balikan ng communication. So isang kumpas mo lang, alam na ‘yung ta-trabahuhin,” Reyes added. Rondina, for her part, simply refused to let last season’s shocking loss affect her mindset heading into the game. She had been at a loss for words after their game against UE last year, and struggled to explain how they had bowed to a team that UST has traditionally dominated. “Siyempre gusto rin naming manalo and gusto rin naming ipakita kila coach na tama ang mga tinuturo nila and magiging worth din yung pagturo nila sa amin,” she added. The win over UE put UST’s record at 5-2, giving them a share of second place in the league standings after the first round. 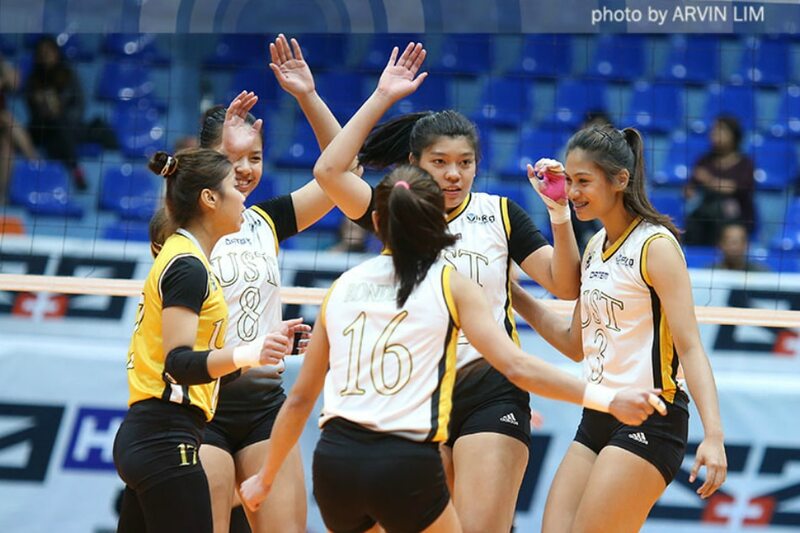 It is the Golden Tigresses’s best start since Reyes took over as head coach in Season 78.